• countless compilation albums to his credit. Dave’s newest release from Magnatude/Magna Carta Records is “Nacimiento” This release finds Dave returning to his roots revisiting Flamenco guitar. Dave was recently credited with a guitar track on the latest Nickelback song “Get Em Up” from NFA. Dave recently joined Juno Award Winning band Bif Naked in Canada and is touring and recording for her next record. Dave has been on the cover of many Canadian Music Magazines as well as having major features in Guitar Player, Guitar World and Guitar One Magazine where Dave was voted one of the top 4 underground shredders in North America! Dave has toured with the largest Rock Guitarist in the planet, Joe Satriani for his Wormhole tour in support with his group Martone. Dave also continuously performs throughout Europe at sold-out concerts in addition to touring and playing in 3 Doors Down alongside of Nickelback and Puddle of Mud. His latest rock record “Clean“ has been signed to New York record company Magna Carta and finds some of the most talented guitarists of our time on it as special guests with non other than Joe Satriani playing alongside of Martone as well as Jennifer Batten who has performed with Michael Jackson for over a decade. Noteable Entertainment & Events is a Vancouver based booking agency, party rental, entertainment services and event production company. 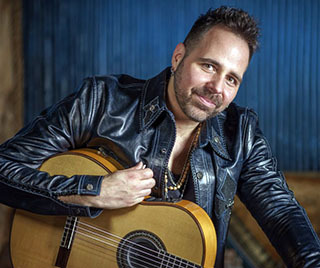 If you are interested in booking Dave Martone please contact us.